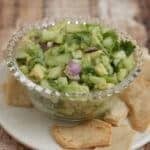 Easy and Delicious Fresh Cucumber Avocado Salsa is healthy, delicious and packed with wholesome vegetables and a little kick of spice. Perfect to use as a garnish on tacos or as a dip for your favorite chips. CLICK HERE to save this recipe to Pinterest so you’ll remember to make it later too! 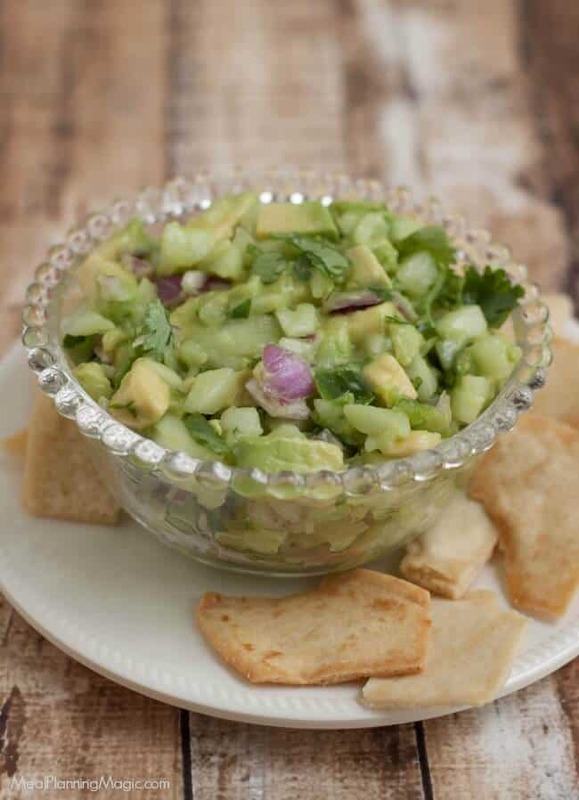 Fresh Cucumber Avocado Salsa is healthy, delicious and packed with wholesome vegetables and a little kick of spice. Perfect to use as a garnish on tacos or as a dip for your favorite chips. I first shared this recipe over three years ago and it remains such a favorite that I wanted to update the photos and content a bit to share with you all again. Have you ever tasted something that after the first bite, you just can’t seem to stop eating because it’s so good? 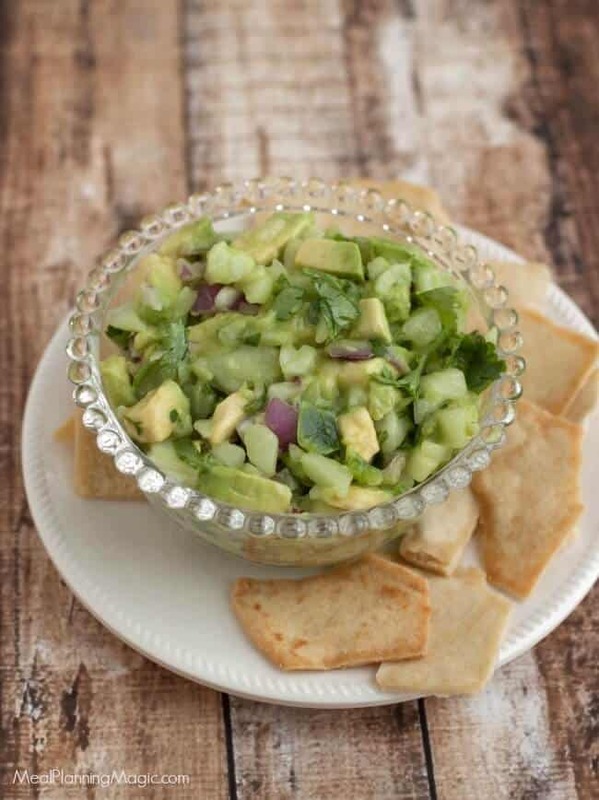 This cucumber avocado salsa totally did that for me! I first tried it at my sister’s house several years ago. She shared the recipe and since then whenever I make it, it is a huge hit and many of my friends request that I make it for all our get togethers. You know the dish that becomes one of your signature dishes? This is one of them. Well, and my Loaded Baked Potato Dip. 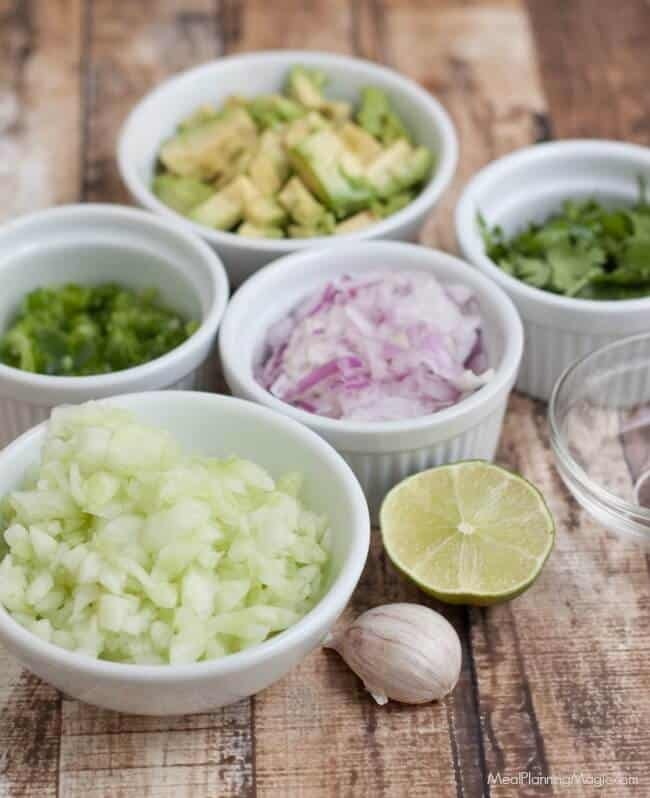 Fresh Cucumber Avocado Salsa is SO easy, you will want to make it over and over again. I often make a double batch, especially for parties, because it disappears so fast. When I made this recently I could not keep my kids out of it! They were dishing it up by the spoonful as a pre-dinner snack. And I was ok with that since it’s chock full of vegetable goodness. We like to eat ours with pita chips but tortilla chips are also good. We also like to have it on tacos of all kinds–fish, chicken, beef–you name it! It’s a very versatile salsa! Despite the number of ingredients, this Fresh Cucumber Avocado Salsa comes together in about 10 minutes so it’s super quick and easy too. I first shared this recipe as party of my Eating the Alphabet Challenge (that I no longer host). 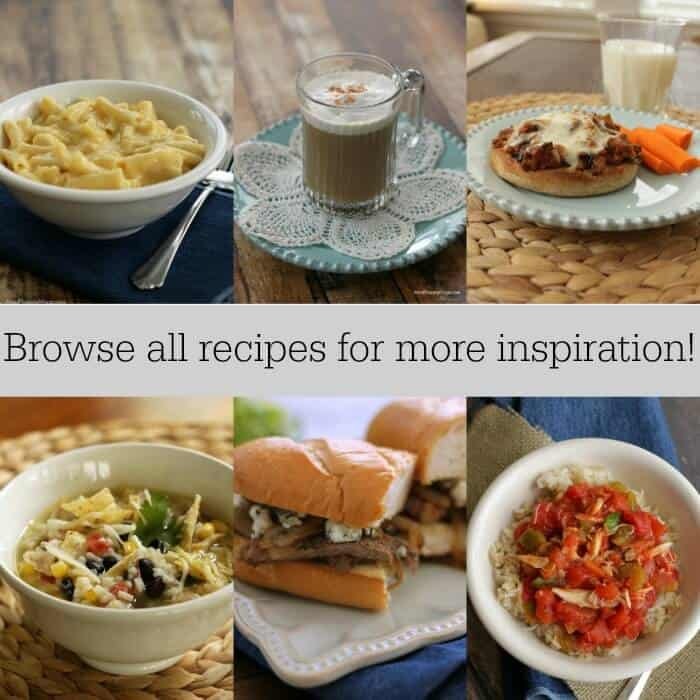 The challenged featured recipes that highlighted a different vegetable or fruit each month. Did you know cucumbers are a great source of antioxidant nutrients including vitamin C, B vitamins and manganese? They are a beneficial anti-inflammatory food and since they are 95% water, they help keep your body hydrated too. 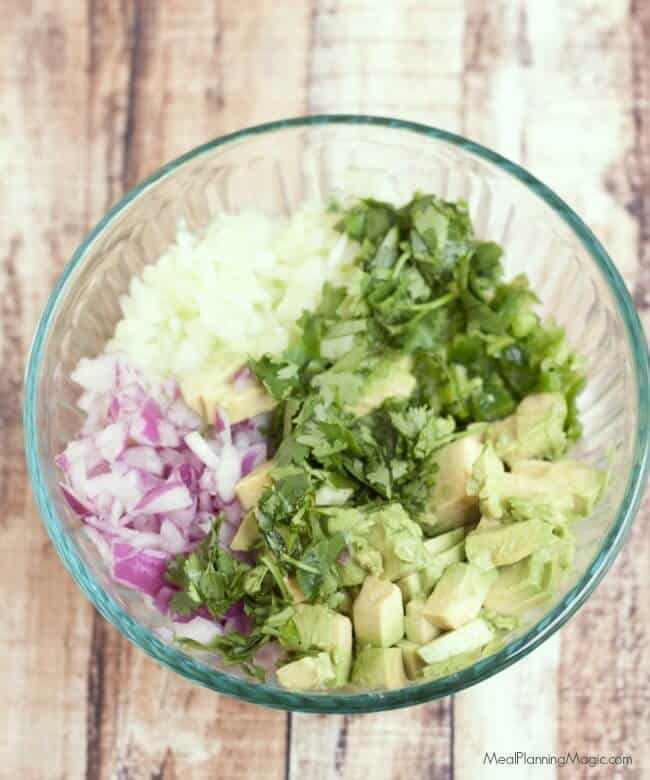 You can feel good when you serve this delicious, nutritious and easy Cucumber Avocado Salsa –I hope you give it a try! Easy and Delicious Fresh Cucumber Avocado Salsa is healthy, delicious and packed with wholesome vegetables and a little kick of spice. Perfect to make ahead (you'll want to actually) and use as a garnish on tacos or as a dip for your favorite chips. Combine all ingredients in a glass bowl. Use wooden or plastic spoon to mix well. Salt to taste. Refrigerate until ready to serve. Serve with tortilla or pita chips. I'd love to know how it turned out for you! Leave a comment below, share "I Tried It!" 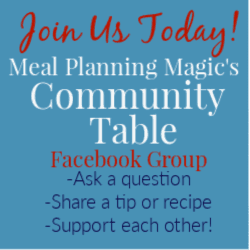 on Pinterest or share a picture on Instagram with the hashtag #mealplanningmagic. YUm! I always think to mix tomatoes and avocados together, but why not throw in a cucumber instead! Thanks Vicky! The crunch of the cucumber really is so refreshing! So colorful! What a beautiful healthy dish! Pinning. Thanks Kathy! It really is the whole package–pretty, delicious AND good for you!